December 24th, 1933 was a regular day in the fishing community of Rose Blanche (on the Southwest Coast of Newfoundland) with the exception of a few last minute preparations for Christmas Day. Several local fishermen were making a trip to check their herring nets in the vicinity of Rose Blanche Point as they had done many times before. However, this trip turned out to be a little different. As the men approached their nets they saw something peculiar floating in the harbour entrance. As they came closer to the object they discovered it was wreckage from a vessel, or more specifically, a section of decking from a schooner. This wreckage was floating just several hundred yards from the Lighthouse at Cain's Island, leading the fishermen to conclude that the unfortunate crew likely found shelter in the Lighthouse. They would soon discover they were wrong. The wreckage proved to be that of the M.V. 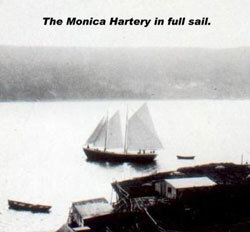 Monica Hartery, a 73-foot Coasting Schooner built in 1927 at Cape Broyle, by Michael Hartery. The schooner was operated in the Coasting Trade before being sold to the Bowring Brothers in St. John's. After a short 'career' under the Bowring Firm, the vessel was again put up for sale and was subsequently bought by Levi Button of Lead Cove, Trinity Bay. Mr. Button was a man of many trades. He had previously worked in New York as a steel rigger. In 1930, he decided it was time to return back home to Newfoundland. Sometime after returning home he became a cop and later a businessman, establishing Grocery Stores in St. John's and Trinity Bay. 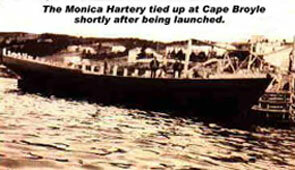 From there, he bought the Monica Hartery, and became involved in the business of Coastal Trading. In the fall of 1933, Levi Button and his crew were chartered to carry gasoline from St. John's to Curling, Nf. During one of these particular voyages, while passing the French Islands of St. Pierre and Miquelon (on the South Coast of Newfoundland), the vessel was battered by a storm that carried away her sails. With her sails missing and a fierce storm raging, the schooner and her crew drifted helplessly in the Atlantic. Fortunately, she was sighted by a passing schooner, and was towed to Channel, Port aux Basques. Upon arriving in Port, the schooner's cargo was discharged and sent to Curling by train. The crew 'signed off' and returned home. The sails were replaced and the vessel was moored at Channel for the winter. Shortly after the vessel was secured for the winter, Mr. Button met up with a local businessman who wanted to charter the Monica Hartery to bring a load of coal from Cape Breton to Channel. However before Levi Button could accept the charter, he had to overcome a minor problem; finding a crew. Mr. Button knew it wouldn't be easy to get a crew from the Trinity Bay area to make such a short trip so close to Christmas. With this in mind he decided he would have to find a crew in the Channel area. Levi Button was in luck. At Channel, he met up with a local Coasting Captain - Alexander Keeping. Mr. Keeping had just finished coasting for the year with his father Theodore and brother George in their schooner Joseph Earle. He was well known in the area and in the Coasting Trade in general. He would have no problem finding a crew to make the short voyage for Mr. Button. In total five crewmembers (including Mr. Keeping and Mr. Button) would make the trip. If all went well, the crew knew they would still have time to make it back home for Christmas Day. 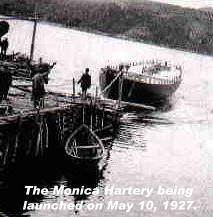 In the early evening of December 17th, 1933, the Monica Hartery departed Channel, Port aux Basques. She arrived at North Sydney the next day. Once at North Sydney, the vessel was prepared to take on a load of coal. However after the coal was loaded, the vessel was delayed in port for several days as a result of weather. Finally, on Saturday, December 23rd, the Monica Hartery and her crew departed North Sydney on their return trip back home to Channel for Christmas. Unfortunately for the crew and their families, they would not be together for Christmas. Sometime after the Monica Hartery left North Sydney the vessel and her crew met their final destiny on or near the Newfoundland coast in the vicinity of Rose Blanche Point. Although most may think that the vessel ran aground, the events that lead to the tragedy remain a mystery to this day. The only thing known for certain is that late on the night of December 23rd and early morning December 24th, the South West Coast of Newfoundland was raged by strong North West winds and accompanying snow that resulted in near zero visibility. From North Sydney the vessel would have to travel in a North Easterly direction to reach her destination at Channel. However the strong North West wind likely interfered with the vessel's intended course (the wind would have been slightly forward the vessel's beam) resulting in the vessel becoming 'off-course' and subsequently wrecking off the Rose Blanche coast. If indeed the vessel did run aground near Rose Blanche, abandoning the vessel would have been difficult. It would normally take the vessel a minimum of 12 to 15 hours to get from North Sydney to either Channel or Rose Blanche, which meant the vessel would have been near Rose Blanche late Saturday night or early Sunday morning. This in turn meant that the crewmembers that were not 'on watch' would likely have been sleeping (or attempting to sleep) in their cabins below. If the fate of the Monica Hartery occurred suddenly in the blinding snow, the crewmembers below would have had very little time to dress properly for the poor weather, thus leaving their chances of survival slim. As for the crew that were standing 'on watch', they may have been thrown from the vessel when she ran aground or even if they weren't, it is unlikely they would have been able to launch a dory without the help of others and/or in such poor weather conditions. As mentioned earlier, one can only speculate the cause of the disaster. Shortly after the local fishermen discovered the wreckage, the area was searched in hope of finding survivors. Unfortunately there were none. The bodies of Alexander Keeping, Samuel Rideout, and William Strickland, along with other small pieces of wreckage were found later that day near Winging Point (in the vicinity of Rose Blanche Point). Their bodies were taken to the local lodge, where they were dressed, and placed in coffins made by the local residents. Mr. Keeping's father, in the Joseph Earle, later took the bodies of the three men to Channel. Three and half weeks later, on January 17th, 1934, a local fisherman from Rose Blanche was returning from fishing when he sighted something in the water. As he came closer to the object he discovered it was a human body. The body was taken aboard and brought into Rose Blanche. 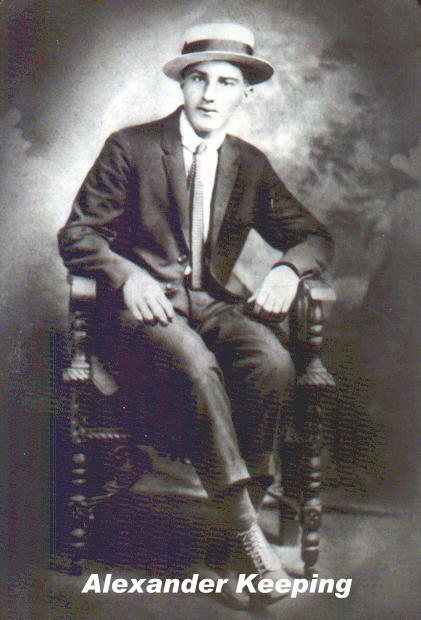 It was later identified as the body of Levi Button. Mr. Button's body was taken to Channel on the S.S. Glencoe and sent back home via train. He was laid to rest on January 27th, 1934. It was never confirmed if the body of Albert Neil was ever recovered. I would like to thank the following people for helping me with this story: Donald Button, Nathan Le Moine, Ananias Button, Barbara Collier and Annie Buckland.